POSTED: Sat, 04/18/2015 - 16:00 | POSTED BY: Traci C.
Which new bracelet do you want? 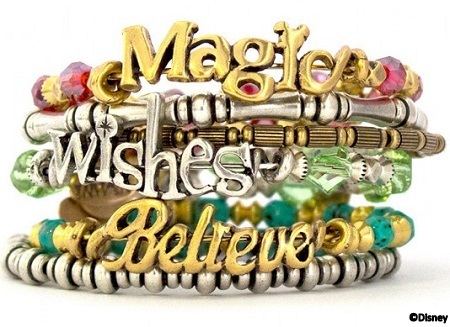 The first new bangles are part of the Words are Powerful collection that is inspired by famous Disney sayings. These bracelets come in Shiny Silver and Yellow Gold and the first with the words 'Whistle While You Work' debuted on April 13. The 'When You Wish Upon A Star' bracelet arrives April 27 and 'Believing Is Just The Beginning' will be at Walt Disney World Resort on May 4. 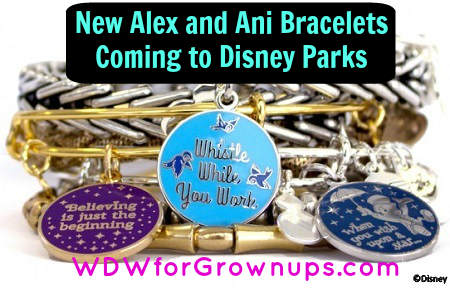 There are also some new Alex and Ani wraps coming to Walt Disney World including a Wishes Wrap in green, a Believe wrap in teal, and a Magic wrap in red. And if you're headed to Disneyland for the Diamond Celebration you can pick up a new bracelet with a Sleeping Beauty Castle charm or the Disneyland Forever bangle with an epoxy charm and two accent charms, including a Swarovski crystal charm. While the Words Are Powerful bracelets and the wraps will be available online in limited quantities, the Disneyland bracelets will only be available at Disneyland Resort at Elias & Co., New Century Jewelry, Disney Vault 28, and World of Disney Store. If you're looking for Words are Powerful bracelets or the wraps at Walt Disney World you'll find them at Disney Outfitters in the Animal Kingdom, Bayview Gifts in the Contemporary, Keystone Clothiers at Disney's Hollywood Studios, Tren-D and World of Disney Store in Downtown Disney, Mouse Gear at Epcot, and the Emporium at the Magic Kingdom. Will you be adding any of the new designs to your Alex and Ani collection? Let us know in the comments. love the words wraps. Won't be in Disney World until Dec. will they be available through the Disney store? I'm going to have to buy them all! Yes yes Yes! I will be there May 1st and will definitely be looking for these!